Princeton High School's a cappella group Around Eight was a big hit at the March 13, 2015 premier of the Climate Change Cabaret at the Princeton Public Library. Here they offer ways both large and small to get from 99 down to zero too many cars on the road. Around Eight led by Landis Hackett. Lyrics and arrangement by Steve Hiltner. Other postings and videos from the Climate Change Cabaret can be found at SustainableJazz.com, with performances of Complaint Training and Breaking Up With Your Car. Some may recognize this house on Lytle Street, which has been in the news lately as a potential tear down to make room for an expanded park on Johns Street. Some town residents have called for the house to be preserved, noting its historic value. Fewer people know that the wading pool in the park next door to it on Johns Street is the last of its kind in Princeton, and may well be torn out in favor of a spray garden. As recently as the 1980s, Princeton had wading pools in all the neighborhood parks. They were part of a program in which each park had its own summer camp counselor. Parents didn't have to chauffeur their kids around to various summer camps, because the kids could simply run out the door down to the neighborhood park and play under the supervision of the counselor stationed there. Kids in the various parks competed against each other in sports. And when it got hot, they'd climb into the wading pool and splash around. "I believe there were wading pools at Grover Park, Harrison St. Park, Pine St. Park, Mary Moss Park and a few others... I’ve heard stories that there were 6 or 7 of these pools at one point in time." When Harrison Street Park was being renovated five or so years ago, some of us lobbied to save the wading pool, which at that time was surrounded by an ugly metal fence. The idea was to remove the fence, fill the pool with soil and make it into a "raised bed bog garden". If the Johns Street park wading pool is demolished, we'll be saying a final goodbye to a more sustainable, neighborhood-based lifestyle, when cars were less needed and kids had free-range childhoods. Nature helped with the child rearing, and "Be back for dinner!" was summer's motto. Is nature our friend or enemy? The answer to that question has significant consequences not only for Princeton's landscape and quality of life, but also for its municipal budget. This past week I awoke to the plaintive groan of leaf blowers somewhere in the neighborhood. Slight digression: Have you ever noticed how machines fill our world with sounds reminiscent of sadness and anger? I had long been aware that my brain has to do extra work to filter out the background noise of planes, cars and other machines. But I didn't really think about what emotion those machine sounds might be carrying until my dog started reacting to the sounds certain trucks or cars make as they pass by on busy Harrison Street. Some must sound angry to him, as he responds as if challenged. A leafblower fills the neighborhood with a groaning sound, as if letting the world know the perpetual burden it must carry. Machines are basically slave substitutes, and the sounds they make reflect all the onerous chores we expect them to do. Oftentimes, we don't hear the sadness, whining or anger in the sound, because there is a positive association we have to the sound of machines: work is getting done. It was only through my dog that I was able to hear the actual sound, rather than the association we have with the sound. That positive association may not be very strong, though, when it comes to leaf blowers. The only small comfort to be found in their drone is that one lives in a neighborhood prosperous enough that neighbors can afford to hire landscapers. Fortunately, in our neighborhood, the noise has thus far been rare. Back to the storyline: The sound, it turned out, was emanating from the small park behind our house, where a crew was blowing last fall's leaves into piles, then raking them onto tarps and hoisting them up into a truck. The cluster of white oaks had kept its leaves all winter before releasing them this spring. In years past, the leaves were simply mowed back into the lawn, avoiding all the bother and extra racket of blowing them in piles and then hauling them out of town. The old system worked fine. Though physical work is admirable, why do work that in past years was found to be unnecessary? I actually went over and asked one of the workmen, and the response perfectly conveys a prevalent opinion, one that drives much of the landscaping in town, public and private. There were too many leaves, he said. Removing them should make the grass better, and there was a concern that varmints might use leaves under the trees as a hiding place. For years, decades really, the Princeton Environmental Commission has been making the opposite case, that Princeton yards are not made better by depriving the soil of the nutrients and organic matter the leaves contain, and that wildlife is a good thing, to be invited into the yard rather than feared. Back when I was a member of the PEC, we wrote a manual about how to utilize leaves rather consider them a nuisance. The case, it seems, is very strong. Leaves are our friends. It's the rejection of them, by piling them in the street and launching fleets of trucks to pick them up and haul them out of town, that is dangerous, polluting, and unnecessarily time-consuming. For years the environmental side of town government has made this case, and yet there remains an entrenched belief, even in municipal departments that could be modeling a more nature-friendly approach, that leaves are like dust in a house--a sign of neglect and a lodging for pests. The view of nature as enemy can be expensive. To export leaves from a tiny park required five workers, three trucks, and two hours going on three or four, counting leaf disposal. At the recent Princeton Environmental Film Festival, perhaps the best film was Inhabit, about the permaculture movement. It was all about working with nature rather than against it. To work with nature, one must study its ways. Its complexity, which many people find intimidating and inconvenient, becomes a source of endless fascination. But park maintenance largely involves keeping nature at bay. Grass grows. Leaves and sticks fall. Nature's growth energy is a constant inconvenience that must be suppressed or whisked away with machines. Many people view their yards the same way. There is satisfaction in cleansing a yard of all its loose organic matter, leaving a clean, uncluttered expanse of grass. But the irony hangs in the air, mixing with the fumes of the leaf blowers, that in suburbia we surround our homes with nature, have parks with nature, and yet even the simplest of nature's processes--that nutrients taken from the ground should be returned to the ground--is fought against. There is promise that this can change, that ecological principals so long expressed can finally become integrated into the daily work of maintenance, both residential and municipal. It will take communication, persistence, and ultimately a change in culture, so that culture begins working with nature, for mutual benefit. Spring in Princeton, and though the flowers are slow to bloom, the first few warmish days have brought a bloom of little lumps of yardwaste out onto the streets. Spring can really hang you up the most, as the song goes, that is if you have some persistent notion that public streets should be attractive, or at least not a three season dumping ground for yarbage. That's my new term, conflating yardwaste and garbage. Trademark pending. Remember those old movies where the shopkeeper is sweeping the sidewalk in front of his shop? It's almost as if people used to take pride in keeping the shared public space they fronted on clean. Question: So what are these strange tracks in the street? Answer: A street cleaner trying to clean streets that can't be cleaned because they're littered with yarbage. Pick up of loose yarbage is once a month in the spring in our section of town. The next pickup for this particular street is three weeks from now, and already there are five or six little piles of leaves foiling the street cleaner's attempt at street cleaning. All of this violates the town ordinance, but to follow the ordinance, a homeowner would have to track down and closely inspect detailed instructions as to when to put yardwaste on the streets. There are five different zones in town, and each has its own individual 2-page long schedule. What these ill-timed piles are saying is that 1) people desire simple, consistent service like we have for trash and recycling collection, and 2) rather than follow directions, people tend to imitate whatever they see their neighbor doing. So, two things aren't working here. One is the loose leaf/brush pickup, whose complex schedule homeowners show little interest in following. The other is the self-defeating nature of the current approach for both homeowners and municipal government. Homeowners sabotage the look of their tidy yard by messing up the street directly in front of it, and the perpetual presence of piles of yardwaste sabotage the street cleaner's mission. It doesn't have to be this way. Princeton could be a leader in New Jersey in finding a solution to this widespread dilemma, and likely save hundreds of thousands of dollars in the process. Question: What is that long white scar running the length of the block? Answer: The mark left by the metal blade of The Claw that picks up all the loose yarbage. But The Claw doesn't pick up all the organic debris, as is apparent in the photo. All that crud--residue from the dumping of yardwaste on the street--adds to the volume of stuff the small street cleaner has to pick up, thus causing the street cleaning machine to need to be emptied more often, thus slowing down the street cleaning. More manhours, more gas, all because loose organic yardwaste keeps getting dumped on the streets year-round. One can make the case for loose leaf pickup in the fall, but there's got to be a way to avoid having to look at messy, scarred pavement for the other nine months. There is, in fact, a solution, one that will bring Princeton into a new era of clean streets while giving people the simplicity and consistent service they want. It's presented in a highly entertaining form here. And presented in an informative form here. See beyond this mess and imagine. Though loose leaf pickup could continue in the fall, keep the streets clean the other nine months out of the year. Containerize, or compost, or both. Kids in grades 3-8 are encouraged to participate in a Solar Jam next month, by designing and building "anything that uses the sun". There are two events: a Solar Car Race and a "Photon Fair". Very cool. 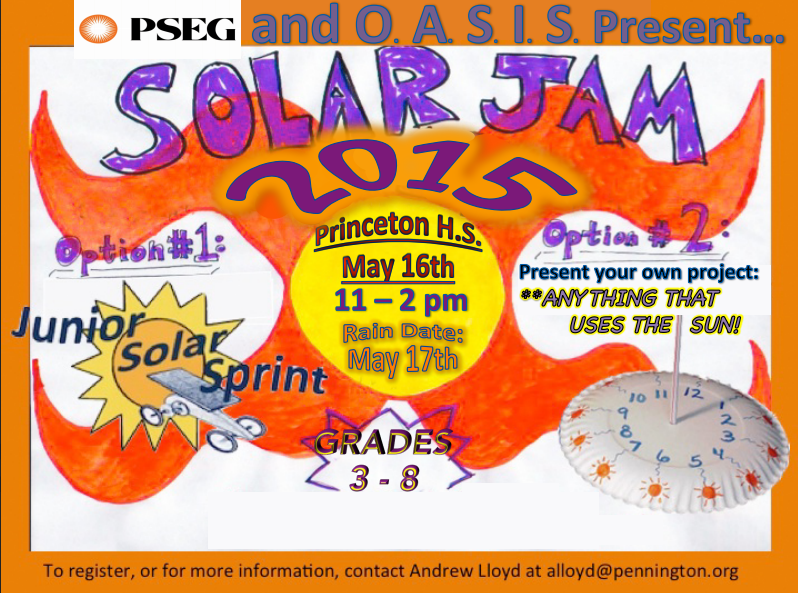 Organized by OASIS (Organizing Action on Sustainability in Schools) and funded by PSEG. Register by May 1. Event is May 16.
sides, for wire to pass through. long as it satisfies #1 and #2 above. panels can be shared while practicing and during race. 6. Vehicles must pass a “Drop Test” from 12 inches off of the ground. start of the race and it moves, it will count as a disqualification. submit receipts on race day. (to buy just the standard “280” motor). derives its form and/or function from the Sun. shadow in solar art, etc. submit all receipts on the SolarJam day. When I look at that massive pile of pulverized concrete that once was the hospital on Witherspoon St, I see a temple, like the Mayan's Chichen Itza, built for some god I don't fully understand. I see the Three Little Pigs, really worried now that their secure house of concrete has been torn down, to be replaced by Avalon Bay's house made of fireprone sticks. I see a disconcerting human enterprise working to increase entropy rather than reduce it. And I see the gravestone of massive amounts of embedded energy. I doubt the words appeared in any reports on the hospital demolition, but embedded energy is the energy that went into making a building. For ancient buildings, that energy might have come from slaves, but slaves have since been replaced by the sacrificial burning of ancient life and future climate. Mining, harvesting, processing, transport, construction--all add to the carbon footprint of a building. The physical manifestation is the building itself, but the carbons that donated that energy from their bonds are still doing their polygamous, transformative waltz up in the atmosphere, each with the two oxygens they met during the building's construction many decades ago. It may not look it, but concrete is very energy-intensive to make. And as Avalon Bay has discovered, concrete is also very energy-intensive to tear down. Could the hospital have been reused? I couldn't track down the articles that would tell what happened to initiatives to repurpose the hospital after it closed. I'm glad questions are being raised about the laxity of building regulations that have allowed Avalon Bay to build large wooden apartment buildings vulnerable to conflagration. A related question, apparently not yet asked, is whether the regulations controlling the repurposing of buildings might be too restrictive. Whether regulatory hurdles discouraged repurposing the hospital, and thereby led to the current mess, is a question that lingers amidst the mountain of debris.